A Wilton Centre-based training provider has created two new education programmes for people working in the science sector to gain qualifications needed to access university. LDR Squared has unveiled two Access to Higher Education (HE) Diplomas designed to support people who either missed out on university because they were unable to meet the entry requirements, or took an alternative vocational route to employment. The Business Studies Diploma and Science Industries Diploma were approved by official accreditation body One Awards and recognised by the Quality Assurance Agency for Higher Education (QAA) on the 29th October 2014. 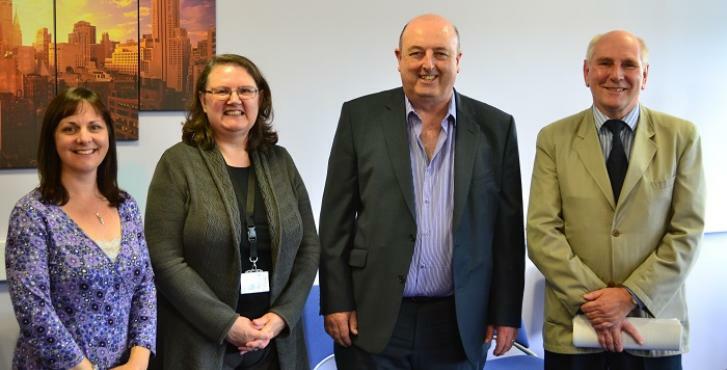 Pictured from left to right Jennie Lawson - Head of Access One Awards, Lynne Smith - Quality Manager LDR Squared, Brian Smith OBE - MD LDR Squared, Dave Duell - Trustee One Awards. MD of LDR Squared, Brian Smith OBE, said: "As we enter our 14th year of business Access to HE is a natural progression for us. It provides a bridge to develop our partnerships and to work even more closely with the HE sector. “We continuously strive to respond to existing and future skills needs of employers." The Diplomas will be delivered from LDR Squared's training facilities at the Wilton Centre, the 75-acre business and science park in Redcar and in Ashington, Northumberland. Delivery will be part time and flexible to meet the specific needs of people on the course. Louise Morritt, CEO of One Awards commented: "The new Access to HE programme LDR Squared will offer from January 2015 is an exciting new development which is unique both regionally and nationally. “Employers and HE representatives were central to the design of the diplomas which offer learners, particularly those already working in the science industries, a fantastic opportunity to progress to HE and move on in their career"
The panel that was consulted on the overall aims of the programme and validated the qualifications included representatives from some of the largest employers in the region and two of the North East's universities. To show their support the science industry company representatives were also present at the Validation Panel, which was a first for ONE Awards. Chris Mullen, Skills Development Lead, FUJIFILM Diosynth & Biotechnologies based in Billingham said: "We are very supportive of initiatives aimed at providing opportunities for people to gain the skills needed for our industry. “From an employer's perspective it was interesting to see how the approval process works and it shows how employers, providers and universities can work effectively together." Stephen Trillo, HR OD Director of Lotte Chemical UK at Wilton added: "We have worked closely with LDR Squared on a number of skills issues and I was happy to contribute to these new Diplomas. “We also work with the University of Teesside so it was rewarding to see how two of our providers have come together to help bridge the gap between education and business in our sector." Site Director of the Wilton Centre, Steve Duffield, added his endorsement: “We are very pleased to support LDR Squared with the facilities needed to deliver these programmes. “This is a welcome and innovative initiative that offers employees an accessible and flexible way to add to their skills and allows employers to enhance and develop their workforce.” The Diplomas are designed to prepare learners for study at university and provide an understanding of working in industry. Registrations will be accepted from January 2015.